In my last post, I mentioned enjoying the things that nature makes available to us in this part of the world. Sharing my activities from this weekend will be an appropriate follow-up to that. 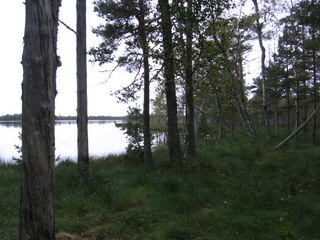 On Friday, my department at work and the department we share a floor with left the building at noon to take a field trip to a bog 60 km outside of Tallinn. Nature walks have nothing to do with my job itself, but some of us decided we wanted to get out of the building and socialize in a more natural setting :-). 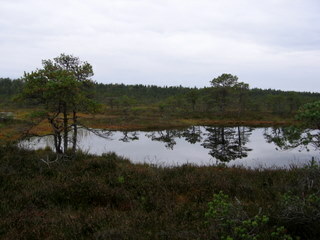 At Kakerdaja raba (Kakerdaja bog– the name comes from a type of bird), we hiked through forests, traversed the bog on a trail made of planks, and listened to stories from our guide, Romeo (…which is not a common Estonian name). The bog offered more than just beautiful views– there were big, ripe cranberries growing along the plank trail, so it was easy to reach down and pop a firm, sour berry in your mouth without even breaking stride (the plank trail is narrow, so we had to walk single file). And just as our stomachs were starting to rumble and we were getting somewhat tired, we reached a forested spot thick with blueberries, even bigger and sweeter than the ones I found in Finland, so of course we made a pit stop there. It was just so satisfying spending a quiet, relaxing afternoon surrounded by a vast expanse of untouched land… complete with snacks. Then on Saturday, I went seenele (mushroom-picking). It’s very common for Estonians to head to the woods early on autumn mornings to fill their baskets with fresh wild mushrooms. Pille over at Nami-nami has written more informatively about wild mushrooms in Estonia than I ever could, so I recommend heading over there if you want to know more about this custom. I was heading into the woods for the first time in my life to pick mushrooms, along with the kind co-worker who had agreed to take me with her. The fact that I’d never done it before is one of those things that reminds me that I’m not a “real” Estonian, as I didn’t grow up here, doing the things that other Estonians have done. But now I’m here, and I want to learn how to find mushrooms. I was shown two types of mushrooms that are good to eat, so that was basically all I was looking for… but I couldn’t find any. I found mushrooms, of course, but they didn’t possess the characteristics I was looking for (and many of them had skinny stems, which somebody told me is usually the sign of a shady mushroom. 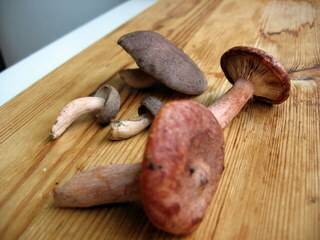 Edible mushrooms generally have fat stems). I enjoyed being outdoors, crouching low to the ground, poking and examining mushrooms that were interesting, if not edible, but after a while I did get somewhat discouraged (my more experienced companions found some mushrooms, but even they were having a difficult time, as there weren’t very many around). But then, wonder of wonders, in the third area we visited, I found one! And a few more next to it! And later, 2 more! So my grand total for the day came to 5 lousy mushrooms, 2 of which were tiny, but I didn’t care. They were my first-ever mushrooms, mushrooms that I’d picked myself and would prepare in my kitchen. And I know that the next time I venture into the woods, I’ll learn even more, recognize even more, and hopefully find more. And maybe it will even make me more Estonian :-).